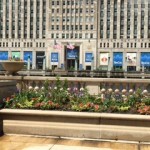 The heavy storm clouds that spanned the skies above the Merchandise Mart in downtown Chicago on Monday didn’t keep the crowds away from NeoCon 2015. Thousands of people seeking the latest trends in corporate office furniture swarmed the 12-story building on opening day. The traditional dull grey, boxy cubicle is a thing of the past. Today’s designs are anything but dull. The sleek lines and retro colors make those that don’t work want to. Trending now are bright hues of orange and green splashed between opaque white or stainless furniture bases with hand-crafted wood or metal surfaces. Most of the manufacturers’ showrooms boast the same retro colors and most have lines that accommodate both seated and standing work, collaboration, quiet spaces, teamwork, lounge areas, and technology zones. A prototype chair that measures biorhythms by Steelcase. The real-time survey of attendees on worker distraction. The results were displayed on wall- sized monitors in the Steelcase exhibit. The Brody WorkLounge, by Steelcase, available in the fall 2015, which features patented LiveLumbar™ technology. The adjustable work surface holds technology at eye level, reducing neck and shoulder strain. A demo of Haworth’s collaborative tool, Bluescape, a scalable multi-touch display. 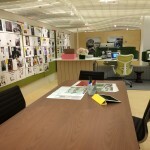 Herman Miller’s Clubhouse, a work environment that features a variety of individual and group work points enabling people to cycle between tasks that that are fixed, mobile, personal and remote technology. Teknion’s collapsible tables and chairs for conference rooms.